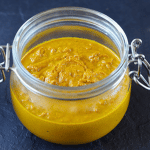 If you have some Turmeric around the house, here’s a simple recipe you can use to help reduce inflammation for your dog … it’s called the Golden Paste! It’s also a powerful anti-oxidant and has many other benefits too! Half a cup of Turmeric Powder (organic if possible). 1 to 1.5 cups of water (filtered is a great option). 1.5 teaspoons of ground Black Pepper. (this helps your dog adsorb all the good stuff). Quarter of a cup of Coconut Oil (organic if possible). Ok, we’re ready to go! Mix the Turmeric with the water in a pan (add the water half a cup at a time). Stir the mixture for 5 to 10 minutes on a low to medium heat (until it forms a thick paste). Now add the Black Pepper and Coconut Oil .. and give it a good stir! Now it’s time to let it cool down. Once your paste is cooled down it’s ready to go. You can store it for up to 2 weeks in your fridge in a covered jar. (then after 2 weeks, it’s time to make some more). So how much of the Golden Paste should I give my dog? Most dog’s don’t mind having the paste mixed in with their food, but if they are a little resistant … you could try feeding them a smaller amount a couple of times a day. If your dog has a sensitive stomach … our suggestion would be to introduce the paste then wait a couple of days before trying again. This will give them more time to get used to it and make it easier on their digestive system. 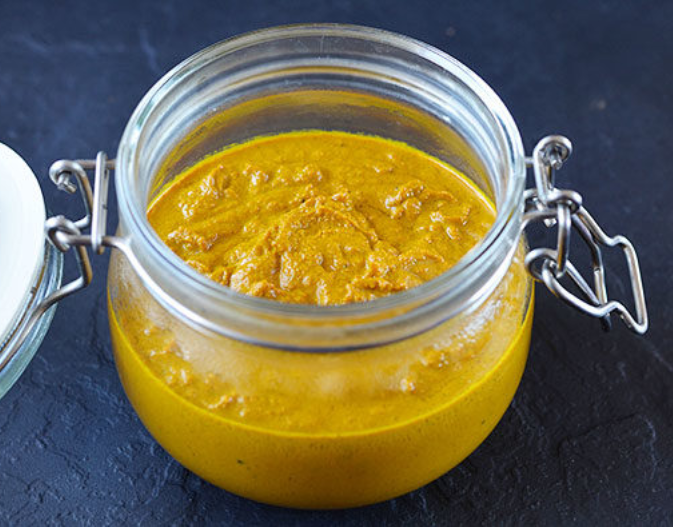 Please note Turmeric is quite a warming spice … so it might not suit every dog.